Do you give up on your fitness goals before you even get started? 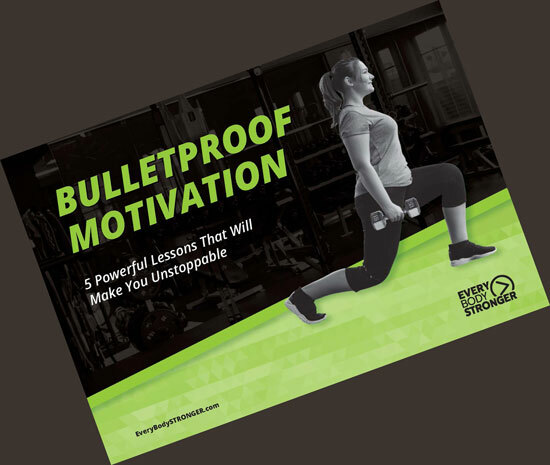 Download Bulletproof Motivation and never stall out again. Thank you for coming by. During my ten years working in the health and fitness industry I have learned that the most effective approach to physical wellness is to Move Well, Move Strong and Move Often. Exercise serves as a critical component of health and I am here to impart the knowledge gained from a life committed to being vibrant both inside and outside of the gym. As a father of two, I understand the challenges of committing to a regular exercise routine. As a survivor of significant medical complications, I can empathise with those facing barriers to maintaining a healthy lifestyle. As a victim of homicide, I appreciate the accomplishment of rising each morning to greet the day. Join me and our vibrant community as we lift, laugh and live legendary on our way to optimum performance. We would love to have you. Unsure of where to start? Try one of our online courses to get you off the ground with expert content and tons of actionable items that you can apply for immediate results. Each course is module based and accessible from anywhere, anytime so you can complete it at a pace that suits your schedule. Topics include Lifestyle Assessment, Food Journaling and Staying Motivated. Need that personal touch? Private coaching provides bespoke programming to match your specific goals, a high level of accountability to keep you on track and availability to match your schedule. Services are accessible online from your home, gym or workplace via video chat or in person at a world-class training facility in Calgary (CityFit). Do you have an upcoming event that could benefit from the expertise of a highly motivating and engaging fitness professional? Bookings are available throughout the year for large and small groups, private functions and tailored workshops. Topics include Foundations of Fitness, Bulletproof Motivation and Behaviour Change 101. Being strong has nothing to do with what you weigh, and everything to do with what you can do. Have you ever written a letter to the editor of a magazine? Did they write back? How about publishing what you wrote?! IMPACT magazine recently published my letter and once you read it, I bet you'll be surprised that they did. When I met Lisa, she was deep in the throes of depression. Pulling a mask over her face to turn up to work, visit with her grandkids and generally function in her day-to-day life. Ten months later she was climbing over a 6' wall in the middle of Stampede Stadium in front of 1000s of people. The spark? She took a huge leap of faith and tried something new. Each time we face a challenge and fail, we learn from the experience and apply those lessons the next go around. I got a little over excited with a project recently and bit off more than I could chew. The results were weighty. Taking a break from your routine can be disruptive but creates a rare space for you to analyse some of the habits and rituals that guide your daily spin. Here are five things I learned while away from my life for two weeks. Many of us have suffered grief and loss as the result of the passing of someone close. Thankfully there are a number of ways for those who have been affected to feel part of a community. Creating an exercise group has helped this collection of Calgary families regain a sense of control in the aftermath of a deeply traumatic event. Having the right tools is always key to getting the job done right and tending to your health is no different. Here are the 5 most effective fixes that you can start using today to improve your health and vitality. We all know one of those pesky Morning People who seem to have boundless energy and free time to play with their kids after the demands of the day are met. How do they do it? It’s an all-too-common story: you were an active kid, played sports in school then entered the workforce and watched your level of activity steadily fade away in exchange for more responsibilities, more money and progressively less hours in the day. Committing to a regular exercise routine can be difficult at the best of times. Whether it’s waking up early to go for a walk or run before the day gets underway or breaking away from your desk to sweat it out in a busy studio, some days you need a pretty strong reason to get yourself moving. Geoff’s journey to a career in health and fitness has been convoluted to say the least. After completing high school and two business degrees in Australia he set off to New York City to establish himself as a human resources manager. Flash forward 10 years and Geoff lives in Calgary, Canada having curated an immensely satisfying career serving the population through exercise and healthy living practices - and never once working in an HR department. During that time he has started multiple successful businesses, met and married his wife and become the father of two spectacular children. He has survived the loss of two organs, battled with the murder of his younger brother and been confronted with his own mortality on more than one occasion. 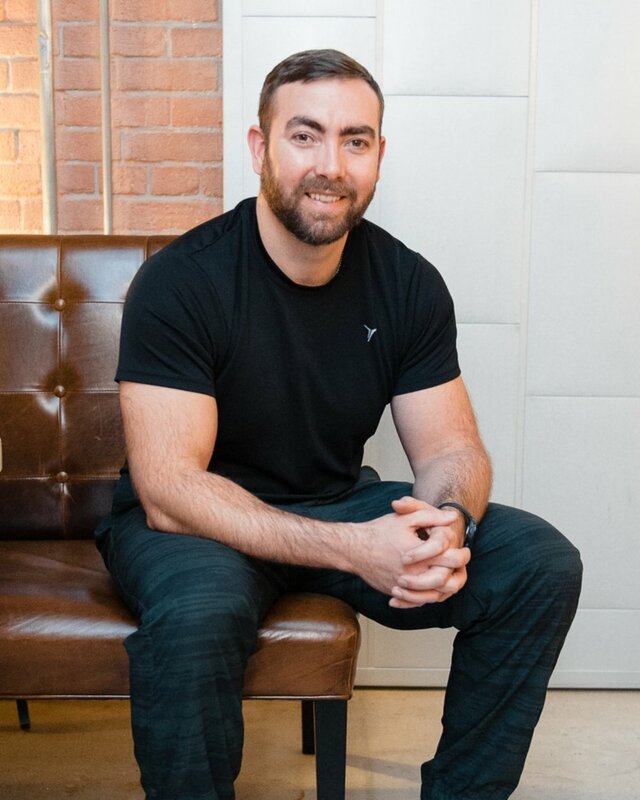 Over his decade working in fitness, Geoff has operated under every permutation of the industry possible from front desk operations to managing a team of 30+ employees and volunteers. From private studios with 100 members to a YMCA with 7000. From a community not-for-profit to a Fortune 500 oil and gas firm. Along the way he has earned multiple MBAs in ’getting s^%t done’ to add to his fitness credentials which include Certified Strength and Conditioning Specialist (CSCS) and Functional Movement Specialist (FMS). Outside of the gym, Geoff has consulted for the Calgary Weight Management Centre since 2012 and serves on executive committees including Mount Royal University and the Canadian Obesity Network (CON-YYC) where he is Co-President of the Calgary chapter. His drive to aid those struggling to add a base level of activity to their busy lives has lead him to expand his coaching to platforms like writing, public speaking and online consulting in order to share his experience with a wider audience. Join the mailing list to enjoy expert coaching advice along with regular insights into living a vibrant life.